Link to the full transcript; here are some of the President’s opening statements. Thank you, thank you, thank you so much, thank you. Thank you. Everyone please take your seats otherwise Clint Eastwood will yell at them. Thank you to Al and Nan, your eminence, Governor, Ms. Romney, Governor Cuomo, Mayor Bloomberg, Cassandra Schumer, all the distinguished guests who are here. In less than three weeks, voters in states like Ohio, Virginia and Florida will decide this incredibly important election, which begs the question, what are we doing here? Of course, New Yorkers also have a big choice to make. You have to decide which one of us you want holding up traffic for the next four years. Tonight I am here with a man whose father was a popular governor, who knows what it’s like to run a major northeaster state and who could very well be president some day and I’m hoping it is Andrew Cuomo. This is the third time that Governor Romney have met recently. As some of you may have noticed, I had a lot more energy in our second debate. I felt really well rested after the nice long nap I had in the first debate. Although it turns millions of Americans focused in on the second debate who didn’t focus in on the first debate and I happen to be one of them. I particularly want to apologize to Chris Matthews. Four years ago, I gave him a thrill up his leg; this time around, I gave him a stroke. Of course, there’s a lot of things I learned from that experience, for example, I learned that there are worse things that can happen to you on your anniversary than forgetting to buy a gift. Now, win or lose, this is my last political campaign so I’m trying to drink it all in. Unfortunately Mayor Bloomberg will only let me have 16 ounces. That’s OK. I’m still making the most of my time in the city. Earlier today I went shopping at some stores in Midtown. I understand Governor Romney went shopping for some stores in Midtown. And it brought back some great memories because some of you know I went to school here in New York, had a wonderful experience here. I used to love walking thought Central Park, love to go to old Yankee Stadium, the house that Ruth built although he really did not build that. I hope everybody’s aware of that. 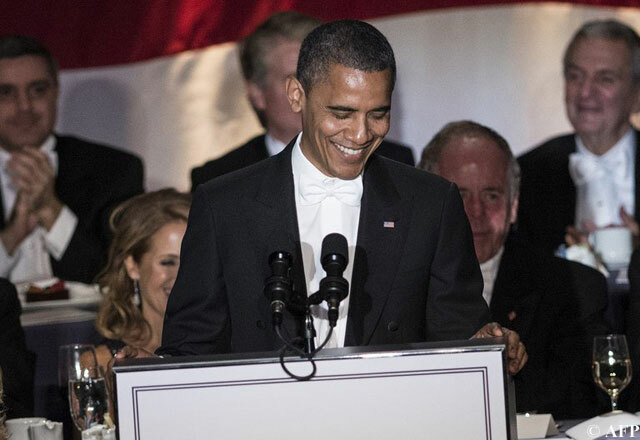 It’s been four years since I was last at the Al Smith dinner. You’ll have to admit some things have changed since then. I’ve heard some people say, Barack, you’re not as young as you used to be, where’s that golden smile? Where that pep in your step and I say, settle down Joe, I’m trying to run a cabinet meeting. Tomorrow it’s back to campaigning and to the cities and towns across our great country and I hear the same thing everywhere I go. Honestly we were hoping to see Michelle. And I have to admit, it can be a grind. Sometimes it feels like this race has dragged on forever, but Paul Ryan assured me that we’ve only been running for two hours and fifty something minutes. … that the unemployment rate is at the lowest it’s been since I took office. And we’re getting to that time when folks are making up their minds. Just the other day, Honey Boo Boo endorsed me. So that’s a big relief. Ultimately, though, tonight’s not about the disagreements Governor Romney and I may have. It’s what we have in common, beginning with our unusual names. Actually Mitt is his middle name, I wish I could use my middle name. And even though we’re enjoying ourselves tonight, we’re both thinking ahead of our final debate on Monday. I’m hoping that Governor Romney and I will have a chance to answer the question that is one the minds of millions Americans watching at home. Is this happening again? And Monday’s debate is a little different because the topic is foreign policy. Spoiler alert, we got Bin Laden.